I think of music but my assumption was tested at the 2017 Piece and Plenty Quilt Guild Show in Rolla, Missouri. At this bi-annual event, I found a lovely handmade quilt called a “Wink and a Smile” and I pondered the name as I took a closer look at the handiwork in each of the custom quilt blocks. The first blocks that caught my attention were the yellow ones. 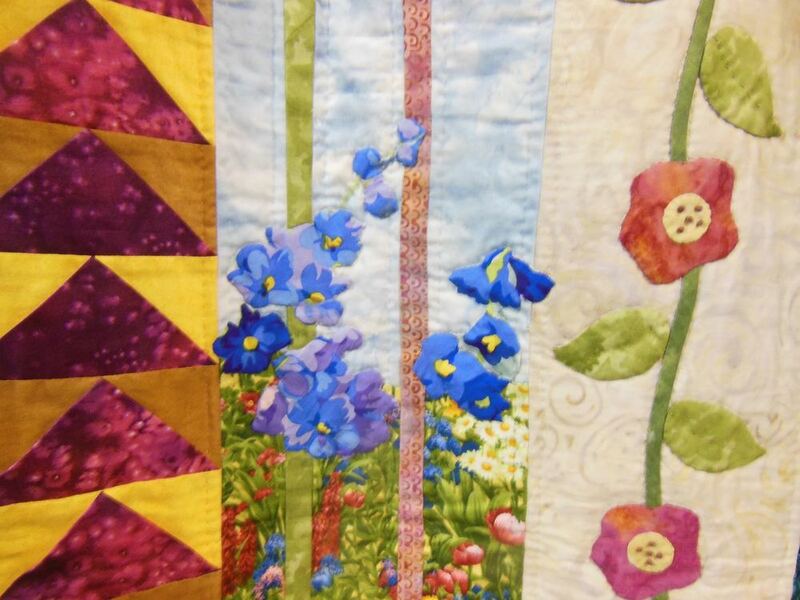 Up close, the blocks in a Wink and a Smile handmade quilt each have their own story to tell. Besides the interaction between two cotton fabrics with yellow, detailed quilting adds a dimension to the overall design. How quilters meld fabrics into their designs is an art all of its own. The intricacy of this handmade quilt is different than how one of my quilters included similar fabrics in a Lone Star Queen Handmade Quilt. Now take a look at how the same machine quilting changes with the Wink and A Smile Handmade Quilt block color, this one a darker, purple tone. The story behind a Wink and a Smile Handmade Quilt is also a reminder that these fabric pieces are not thrown together in days, it can literally take years to get them completed. A quick peek at one more Wink and a Smile Handmade Quilt block, this one featuring pink cottons. Again look at how the same machine quilting looks different yet again. Do you suppose that’s how this charming handmade quilt got its name? Are your January days cold and dreary? Ours in mid-Missouri are so this time of year I try to bring in as much color into my house as I can. I still have poinsettias with their leaves turned red and pink; some of my moth orchids have re-bloomed and salvaged begonias are brightening up my kitchen. It’s at this time of year that I also think about how to warm up my rooms with quilted wall hangings.At the bottom of my steps to my basement, I just hung a Four Seasons Lap Quilt Wall Hanging to brighten the landing and remind myself winter will soon be over. 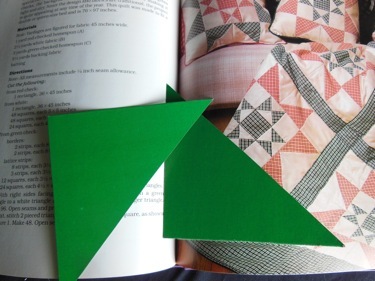 Luckily many small handmade quilts or lap quilts and throws like this one also include tabs on the back so they can easily be made into wall hangings. When not in use, the tabs sit flat on the back and don’t interfere with using the handmade quilt for naps. One of my favorite places for home decor inspiration is local quilt shows such as the 2017 Piece and Plenty Quilt Guild in Rolla. One of the custom handmade quilts and quilted wall hangings that I would love to have on my wall this time of year is the Dragon Dance custom handmade quilt and wall hanging featured here. Made by Laurie Miller, of Rolla, this lovely piece of fiber art won a first place for the best incorporation of the challenge fabric. In other words, the quilter was given a fabric they had to incorporate into their custom handmade quilt and Laurie was the best in show. Nice going, Laurie! When I first started my custom quilt business, my first quilter and I used to spend hours pouring over potential project fabrics to ensure that we had the right fabric combinations. 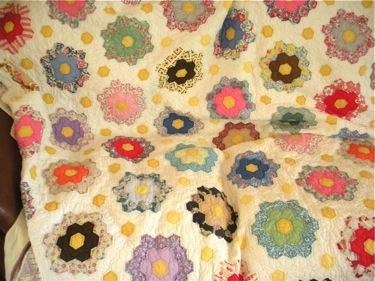 Since then, I have seen dozens of beautifully- made custom handmade quilts that suffered from poor fabric selection. If the fabrics are wrong, it doesn’t matter how accomplished the quilter is, incompatible fabric colors will lead one’s eye. Which is yet another accomplishment of this custom handmade quilt, even with all of the primary colors and strong tones, they seem to like each other. And can you imagine this hanging on a wall in your house brightening up the corner? Can you spot all of the baskets in this handmade quilt by a master gardener friend? As I was dusting off some of my favorite baskets earlier today thinking of spring, I remembered this handmade basket quilt from the fall 2017 Piece and Plenty Quilt Guild quilt show in Rolla, Missouri. The handmade quilt had been made by a master gardener colleague of mine but what I recalled was that I had intended to count how many actual baskets were featured in the quilt. Baskets are an important element in my life. Besides cat napping spots and storage areas for books, I keep baskets to carry plants around in my garden so I keep many baskets in various shapes and sizes around my house. 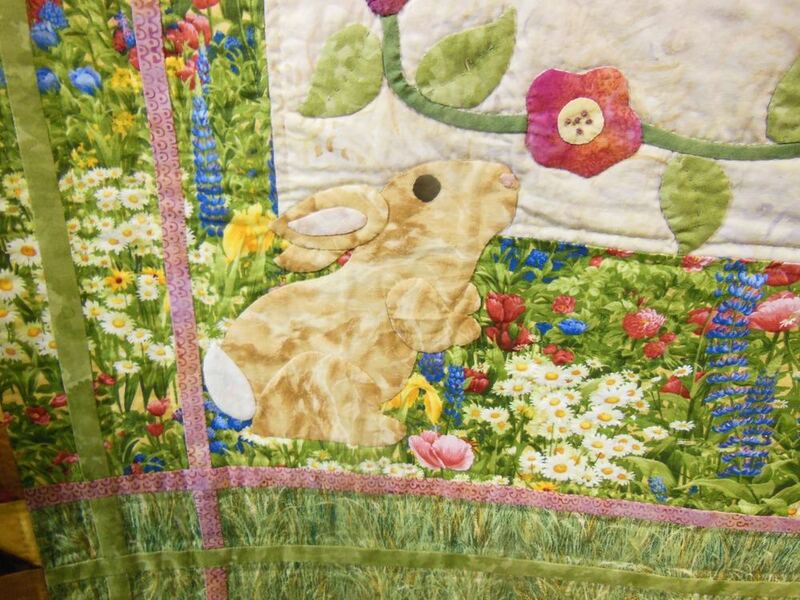 This lovely, award-winning quilt also seems to suggest baskets are good for a variety of chores, starting with collecting strawberries. This strawberry seems to be growing in it's own basket! Each one of these quilt blocks feature lovely baskets such as the strawberry sitting in its very own colorful container. An applique red bird appears to be getting ready to fly off ned to a basket holding a pretty flower. 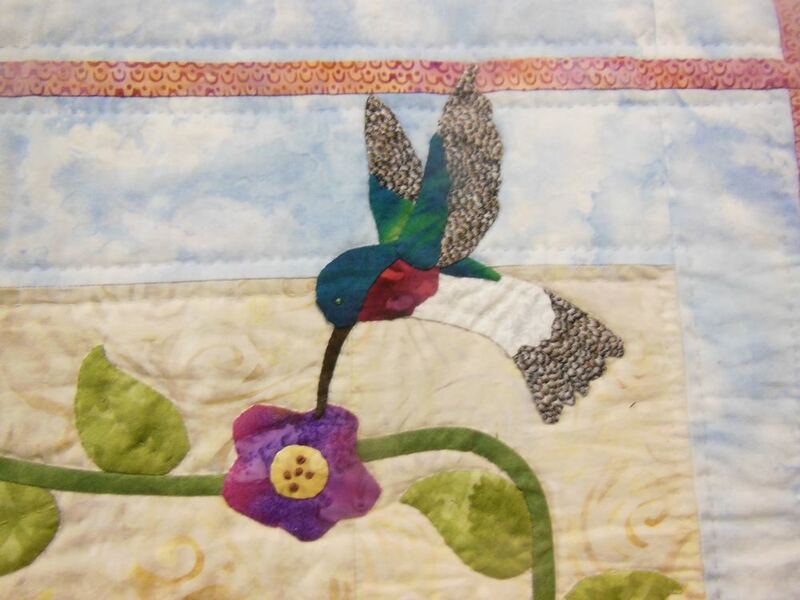 Look at how the machine quilting adds nice texture to the quilt background. This red bird is keeping a lovely flower in a basket company. This side of the handmade basket quilt, with the award ribbons, feature smaller baskets. Basket handmade quilt won a second place award at the quilt guild show last fall. Each handmade quilt has it's own story, one of my favorite parts of any quilt show. This quilt took a little extra time from start to finish, according to Marilyn's accounting but it sure was worth the effort! One of the wonder features of any handmade quilt is the story behind its making. In addition to the variety of baskets, I liked the fabric color combinations, the bright colors will help this quilt have a long life. I know these squirrels, I've seen them in my garden, in particular in my Bartlett pear tree! It was hard not to be drawn to this charming handmade quilt displayed at the 2017 Piece and Plenty Quilt Guild Show in Rolla, Missouri in October. 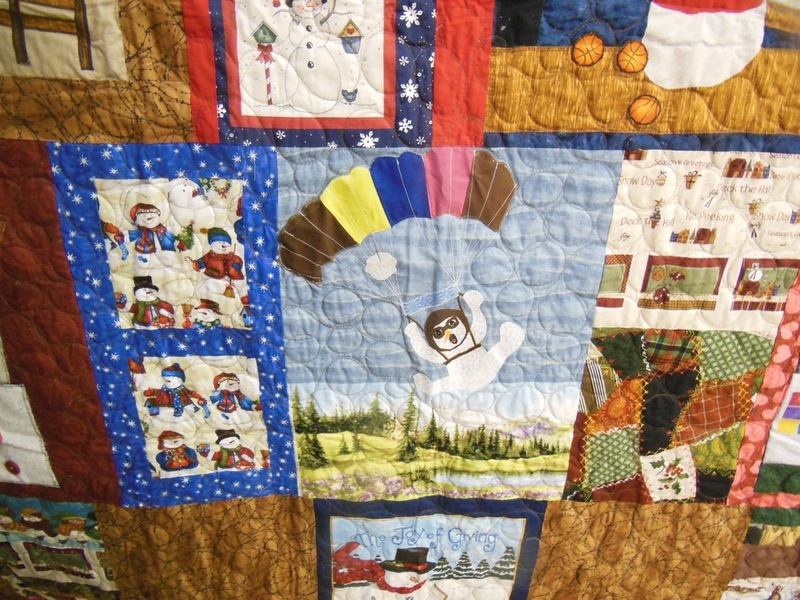 The quilt colors are bright and captivating, as are the pilgrim-dressed squirrels at the top of this brand new quilt. The teeny tiny pumpkins the male squirrel is carrying are very impressive, too, imagine how small those fabric pieces were to cut out, the quilter must have been very patient and very careful! From a distance, the overall quilting in the white space adds a nice dimension to the quilt. 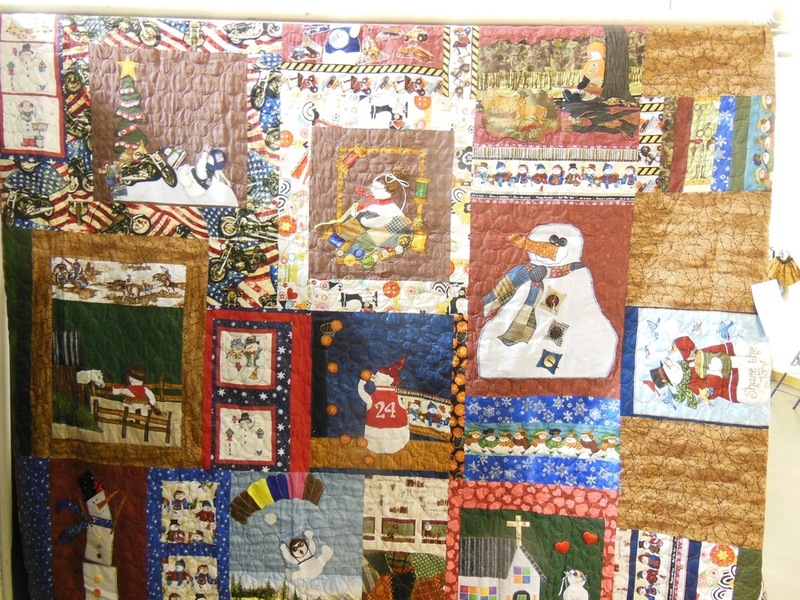 Each of the quilt blocks in the center also have individual characters, from the owl and the pumpkin to more squirrels, acorns and wreaths. If I were to start a collection of quilted wall hangings, this would be one I would want to make to represent Thanksgiving and have it hanging on a wall somewhere, maybe in an entrance or a den wall, where I could enjoy it every day. That's one of the advantages of quilted wall hangings, they can quickly change the theme of a room and update home decor to a seasonal mood. Glad to see the quilter saying this was a "fun" quilt to piece, that's as it should be. This next quilt block helps to show the detail of the machine quilting, which gives this handmade quilt so much texture. It still surprises me how much quilting can change the final look of a quilt. Cute orange pumpkin block sits in the middle of the detailed quilting in the white space. Here's wishing your home has a "perfectly seasoned" Thanksgiving, from ours, which is definitely more squirrelly! This custom handmade quilt combined floral prints with patchwork blocks and special words. Do you know the expression "Sticks and stones may break my bones but words will never hurt me?" I thought about that little saying when I first saw this custom handmade quilt on display at the Piece and Plenty Quilt Guild annual show in Rolla, Missouri. Not that I believe those words because words can hurt. Just think about all of the bullying we see around us today. Words can also heal. And elevate. And affirm....such power from 26 letters in the alphabet! Love the story behind every custom handmade quilt almost as much as the quilt itself. As I was perusing the blocks for the first word Kathi had featured, I smiled. Who would have thought this word was worth a block all by itself, but it "did." Another very special word in this custom handmade quilt, and one that is precious when one truly finds one. I can remember my mother saying in life one is lucky to have a handful of people one can truly call "friend." A word that means so much, and we have so few of them really in our lives, a "friend." What other words would you include in your custom quilt? 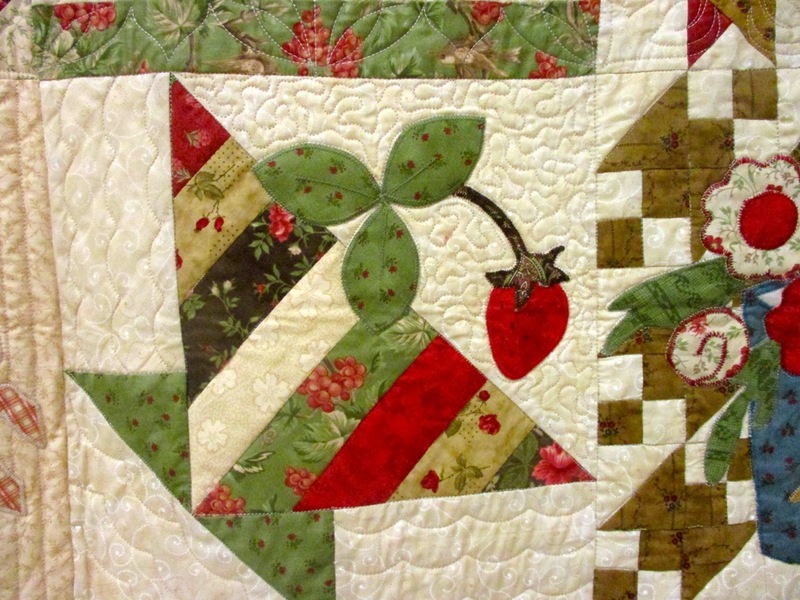 Cynthia Felts made this design for what she called a red and white spring handmade quilt. When I think of spring garden sampler colors, pastels usually come to mind - soft pink, baby blue, spring yellow, iris purples. In other words, red and white is not one of the usual spring color combinations. As I was going through the quilted wall hanging section of this quilt show, this Red and White Spring Handmade Quilt caught my attention for that reason, at first. I also liked the different applique baskets around the border, each one of them a different fabric. Some baskets even have a handle gone askew, which is more like some of my typical flower baskets. This is one of a number of handmade quilts that were featured at the 2015 Piece and Plenty Quilt Guild show in Rolla, Missouri. 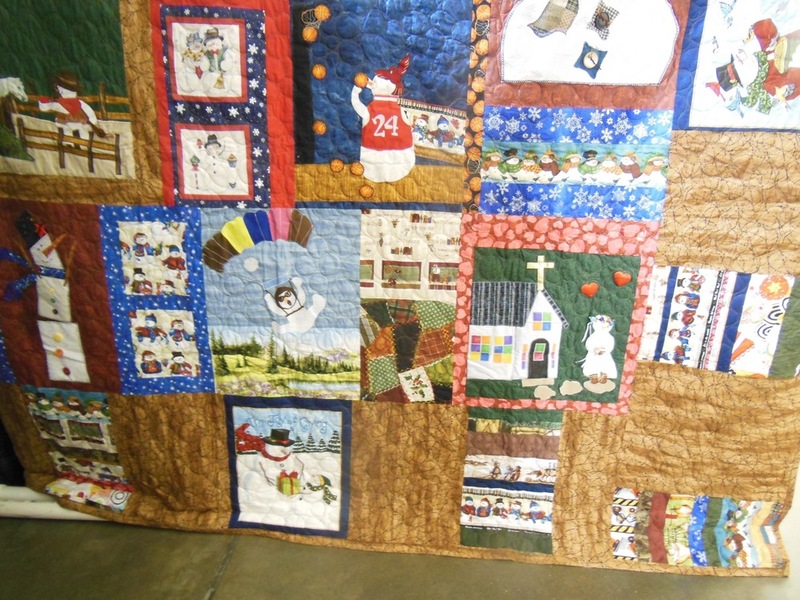 This handmade quilt was also quilted on a home machine. In addition to the unique design and color combination, this charming quilt was also quilted on a home machine. 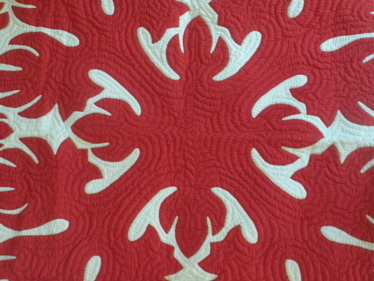 Look at the lovely swirls in the background that give this quilt its rich design. It may not be a traditional spring color but now red and white is one of my favorite spring colors! A customer's wedding invitation he needed printed onto our custom fabric blocks. This Bluebird Gardens customer was making a quilt as a wedding gift and needed this "Eternal Love" wedding invitation design printed on fabric. We have tried a number of printable fabrics and this one is the best one we have found on the market, an especially-treated white muslin that peels off the paper backing so that it can be cut to size. These custom fabric blocks are washable in cold water; dry on cool, just as our custom quilts should be washed. The wedding invitation now printed on our custom fabric block. Anything that can be printed can be scanned and placed on these muslin fabric blocks. Photos, original art, mementos such as tickets, invitations, cards - whatever is special that can be scanned can be printed. We use these same photo fabric blocks when making our custom photo memory quilts, custom children's art quilts and quilts out of clothing with photos incorporated. A close up of the design of this charming wedding invitation we printed on muslin fabric. So pretty, and the printed colors look just as bright as the original design! Just in time for Christmas planning, here's how to easily make a custom personalized memory throw. This is a quilt one of my friends made for a family member. She had never sewn, or quilted before so you know this is going to be an easy project. So simple, she used marbled solid fabrics so family members could write on them with an indelible ink pen. Did they write on the quilt blocks before or after it was put together? Afterwards! We printed some of the photos on fabric and she cut them into the same size as the fabric blocks. 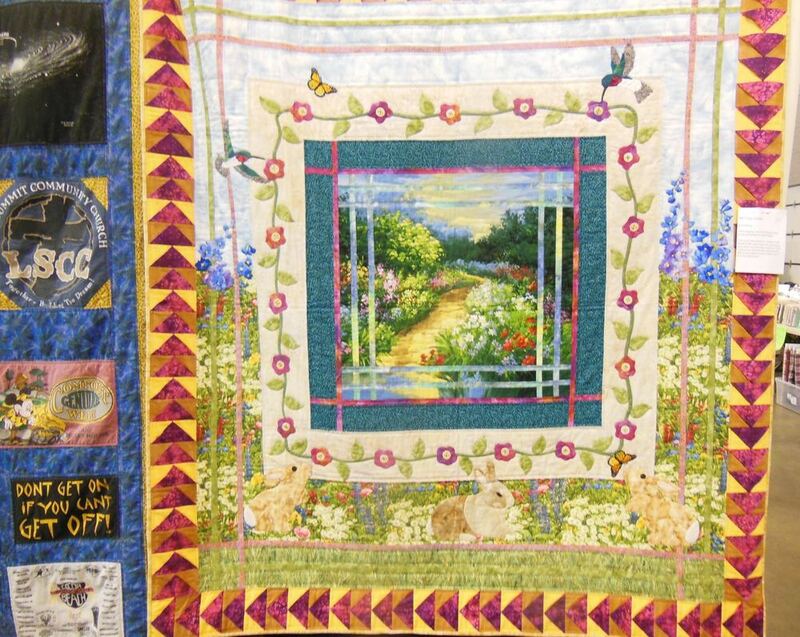 She added a solid frame around the blocks and an prairie point quilt edging. The custom personalized memory throw was finished with prairie point quilt edges. Turned out quite well, don't you think? Choosing fabrics for a custom sleeping cats quilt in pinks. Making custom quilts are a lot of fun because we get to know our customers. In this custom sleeping cats quilt order, the customer wanted a queen-size quilt in pink tones. Since pinks can range from cheek-soft to sunset deep pink, we start with a variety of pink fabrics so the customer can tell us which direction they want to go in with the fabric tones. In addition, choosing fabrics is a treat since we can make all of them different or repeat fabrics and fabric color patterns. If in doubt about the colors, send us a paint chip card to make sure we are matching the colors you want. In this custom order, the customer liked the five fabrics in pink and white tones so that is what we will be using. The customer has two rescue cats. From their descriptions, pink is their color! I catch myself sometimes when I hear someone describe Bluebird Gardens as a quilt-making company. Considering the projects we complete, I think of us more as repurposing memories, especially on this Memorial Day weekend when we should take time out to remember loved ones who are no longer with us. We do make a wide range of custom quilts; some traditional, most unique to the customer. What makes our custom quilts and associated projects different is that often we are making a memory catcher for someone who has died. It may be a quilt out of clothing from a departed husband; a wife who died of cancer, or a quilt a wife with cancer is having us make for each of her children so they will remember her when she's gone. The quilts out of departed children's clothing with pictures are the hardest. Looking at those young faces, I think about the souls those faces represent who have left us much too soon. To some, Memorial Day weekend is about the beginning of summer. To us at Bluebird Gardens, Memorial Day weekend is a time to remember all of our customers and the memories we were honored to help them capture. Easter is a time of renewal, especially in a garden. Every day there is something new growing, or returning, to my limestone hillside garden. 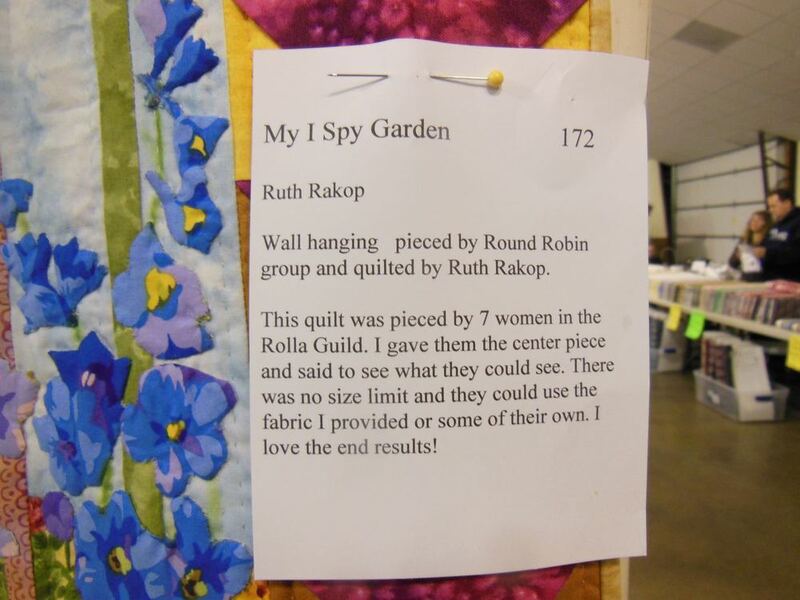 The spirit of renewal has been nicely captured in this "I Spy" Garden Quilt made by 7 members of Rolla, Missouri's Piece and Plenty Quilt Guild. The guild, by the way, is planning a fall 2015 show where they feature the work of their very talented members. 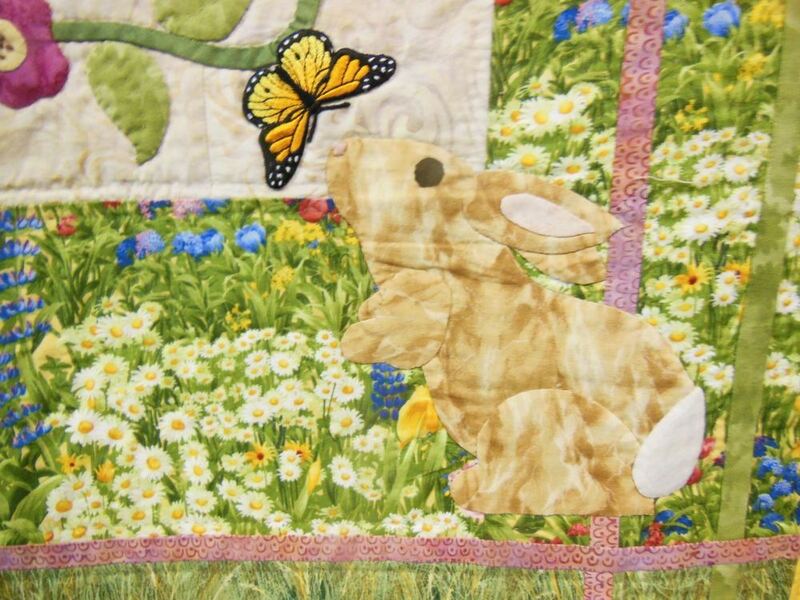 Whether its animals, or flowers, this teamwork applique and patchwork quilt is fun to see. What all do you "spy"? Pretty applique blue larkspur. What else? No garden is complete without a hummingbird or two! Or one, or two, rabbits. Over the years, we have shipped our quilts with a quilt care guide so they live a long fabric life in their new homes. First it was a full page on the back of an invoice, then a folded brochure, neither one necessarily the easiest items to store for easy access. For 2015, I am happy to introduce our new business-card size quilt care guide, easy to store with other business cards if you need to retrieve later. You can also now easily tuck the quilt care guide into a sewing basket or jewelry box as a special memento of the personalized gift. For Bridgett, who ordered a custom dachshund quilt as her Christmas present but didn't get it until January, we added a gift card from her husband Jim so that when she opened the box, it looked like a present. If you need more detailed information on quilt care, we also have a more extensive quilt care guide online. You are also always welcome to ask us. Do you have any questions or issues with caring for your quilts? For the budget-conscious bride, consider our double wedding ring throw pillows, featuring one set of rings and still having a center space for embroidery. We can make double wedding ring pillows in custom wedding colors to celebrate the wedding decor. Another way to make unique wedding gifts is to add embroidery and photos with a special dedication to make unique parent's gifts. 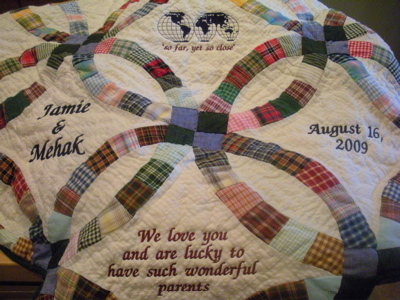 You can simply add the couple's name and wedding date, or select favorite poems, sayings and photos that can then be added to the quilts to make them more personal.